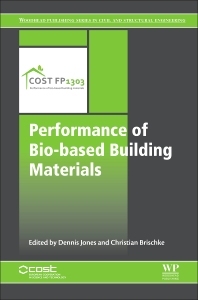 This book shall provide guidance on the use of bio based building materials (BBBM) with respect to their performance. The book is focusing on BBBM currently present on the European market. The state of the art is presented regarding material properties, recommended uses, performance expectancies, testing methodology and related standards. Lacks of information and knowledge will be identified. Future research needs are highlighted. Promising developments that could become commercial in the near future are presented as well. This does not exclude the majority of ‘old and traditional’ BBBM since quite some of them are experiencing a comeback or have never disappeared from the market. The aim of this chapter is to provide an overview of methods available to enhance the properties of bio-based materials. This will only provide a general introduction, since there are a wide range of existing texts on these subjects, and readers will be directed towards these. Clear description of how ‚performance‘ can be defined and understood. This might be done by considering different viewpoints, e.g. of architects, engineers, end users, academics, biologists, market researcher, etc. How do people living inside and using the building or constructed asset influence its performance? Effect of ventilation habits, cleaning, maintenance, wear, etc. Overview of the demands for improved building performance, and how bio-based materials can help meet these demands now and in the forseeable future. Dennis Jones, the Chair of COST Action FP1303, has more than 20 years’ experience in wood and bio-based material research and technology. Currently working as a consultant, he is affiliated with Luleå University of Technology in Sweden and the University of Primorska in Slovenia, having previously worked in Sweden, the UK, Denmark and The Netherlands. Christian Brischke is the Vice Chair of COST Action FP1303 and is a researcher at University Göttingen in Germany and has a prolific publication list in areas linked to protection and performance of bio-based materials. He is also active within the International Research Group on Wood Protection, where he is currently a committee member for the group “Test Methodology and Assessment” as well as a member of their Communications Committee.